The formation of polyps in the colon is common and can arise for a variety of reasons ranging from lifestyle choices, including diet and obesity, to genetic predispositions. Polyps are typically detected upon routine endoscopy and the percentage of adults presenting with one or more polyps increases significantly above the age of 50. Polyps can be benign or malignant and in some cases, if left untreated, polyps lead to colorectal cancer. Exposure of animals to the carcinogen Azoxymethane (AOM) results in a somatic inactivating mutation in a Wnt pathway kinase responsible for targeting β-catenin for proteasomal degradation rendering the pathway constitutively active. 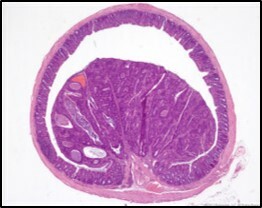 This mutation leads to the generation of spontaneous cancerous colorectal polyps that are similar to those observed in human patients and therefore provide a physiologically relevant animal model for spontaneous colorectal cancer. In addition, a combination of DSS treatment and AOM results in production of colitis associated colon cancer due to added damage to the mucosal layer and concomitant inflammation of the GI tract which exacerbates the insult of AOM exposure. Similar to patient population where colonoscopy is used to assess the presence of polyposis, our animal models utilize High-Definition video endoscopy to detect and quantify the extent of polyposis. Mice are administered a single injection of AOM followed by seven days of exposure to DSS-treated drinking water. The colon is then examined for number and size of polyps using video endoscopy on days 14, 21, 28, 35, 42, and 49. Video endoscopy allows multiple in vivo assessments within subjects and provides a visual record of disease progression without the requirement of sacrificing animals at each session. Endoscopy images of polyposis are scored by a blinded observer using Biomodels’ validated scoring scale. At the time of sacrifice, the colon is dissected, weighed, its length measured, photographed, and examined using traditional histology methods. Additionally, polyp biopsy punches can be taken in order to assess target analyte or compound levels specifically within the cancerous tissue.